The first thing to check off my 40 Before 40 list is throwing myself a birthday party! I threw a party for my girlfriend last year, when she turned 40. I asked Matt if he would ever throw me a party. I don't know why I asked, I already knew the answer! He doesn't even like to go to parties, much less plan them! Knowing that, and this being my 40 before 40 year, I decided to throw one for myself! My 39th birthday party! I wanted to do something on my actual birthday. I wanted to do something where many people could attend, based on their schedule. I had told Q we would get pedicures on my birthday, so as I started thinking of things to do, and where I would fit my workout in, pedicures, a party... it hit me! I decided to plan a progressive birthday party! I'm going to hand it to myself, it was a great idea! I thought through it and made up my invitations. I emailed friends and started a FB event. I wanted people to be able to plan times, and give me an idea of who would be attending, so I could plan which location would be best for each activity. I initially thought about a group walk/run, but figured I'd have a smaller chance of people coming if they thought they had to run with me! Instead I asked my friend Ashley to come and do more of a sculpting/cardio mix workout for us. We did it at a park, a good place for many, or just a few people. It was a success! I had some buddies get on out in the morning and we got werked! We did all of our exercises around and on the park equipment and on the bike path. It was a great workout and we all enjoyed the push that comes from being together! Loved it! It was a great way to start the day. I gave everyone a water bottle with my favorite hair elastic (that I told you about HERE) attached to it. Here is the tag I created for this party favor. This was the main thing I needed a count for. I waited to see who could attend then decided where we would go. There were just a few of us for this activity. I'd actually gone in prior to see if we needed to make appointments for all of us. They, of course said we didn't, and would be fine just walking in. This was Q's first pedicure! I'm glad L was able to come so the two of them could be buddies. It was great girl time, man it feels good to have running feet rubbed! I need to lotion up and do that for myself more often! I gave everyone a nail polish as a party favor. This was one of my biggest concerns. What if a ton of people wanted to come? Where could we get a bunch of people to fit? I was thinking I needed somewhere outdoors. Lloyd's Taco Truck was the perfect solution! Doing lunch at the Taco Truck was a great idea! We didn't need a reservation, people could come as they wanted, bring kids, there was flexibility for how many people showed up. It was great! The only downer was our location was in a business parking lot! I found a grassy spot we could all sit at, so we could visit, and I could see if more people showed up. We ended up getting kicked off that, right as we finished with lunch. Woops! So, I recommend scouting out the taco truck location next time! It was great to see another group of people, to sit and chat, and feel loved! I'm so grateful to all who came! Everyone got something sweet as a party favor. I had so much fun getting ready for this part! I actually planned on getting the most visitors for this portion, based on RSVP. Unfortunately, for some reason, all the people I thought were my friends didn't show! :) Kidding... mostly! I realize it was on a Tuesday, and the hours were weird. Probably should've done more of a late evening activity, for those who work etc. Still it was a party, and I love a party! I did a soda bar, infused water bar, and snacks. 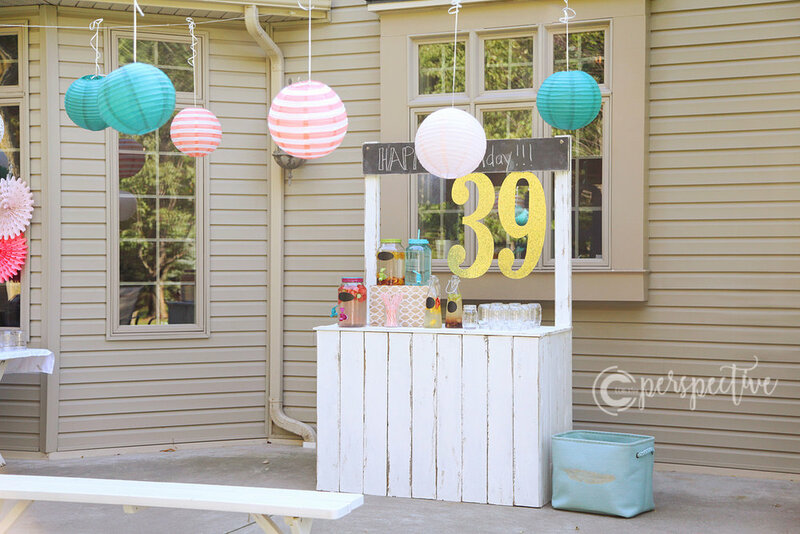 Here is a look at my 39th birthday party decor. I was looking forward to this part of the day. Sipping soda, relaxing, and visiting with friends. Again, I'm so thankful for those who joined me, made me feel special on my day! These party favors were water infuser tumblers, so everyone could do their own infusion! After my party Kierste and I went out to dinner. Loved it! My family and I celebrated together, later that night. It was a wonderful day. I'm happy to be alive, happy to be surrounded by fabulous people, reminded that life is joyful, and really what you make of it. It's going to be a good year. 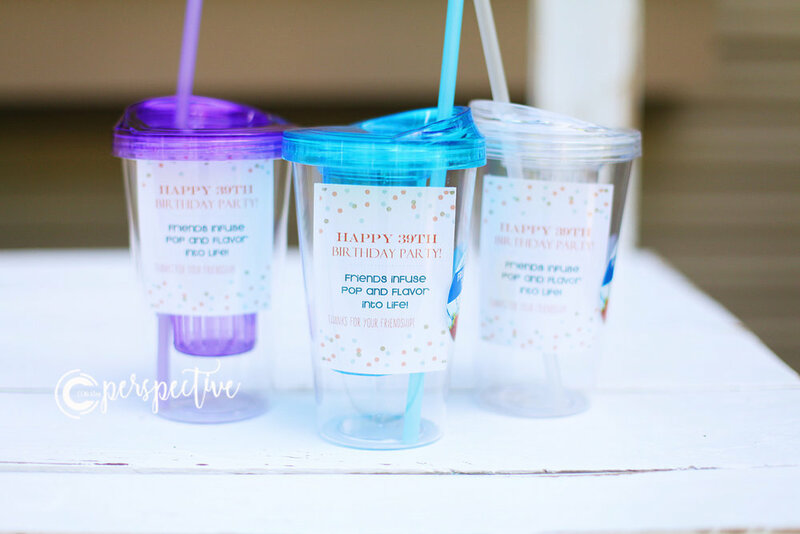 Now, if you want to throw a 39th birthday party of your own, you can use these party favor printables! I have them both individually and grouped together, for download, HERE. Feel free to pin this and share!!! Save the idea for when you turn 39!